A dust bath is more than a fun game or occasional entertainment for your chickens – it is an essential part of grooming to keep the birds' skin and feathers in peak condition and free of mites, fleas, lice and other parasites. Fortunately, it is not difficult to give your chickens a dust bath to help keep your flock clean and healthy. The dust your chickens will appreciate most is far different from the lightweight, omnipresent household dust you may always be cleaning. For chickens, the very best dust is fine, dry, powdery dirt that will absorb oil and moisture but easily falls off feathers while shaking, without needing any rinsing. If the soil in your chicken run or coop is dry and powdery, you may not need to make any additions or changes to its composition to make it suitable for a dust bath. 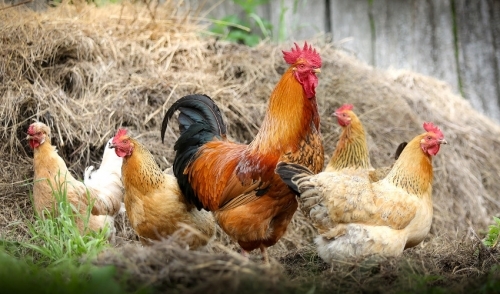 Many chicken-keepers do add wood ash, charcoal dust or food-grade diatomaceous earth to a dust bath, however, to make its texture more appealing and absorbent for chickens to use. It is important, however, to avoid adding any unnecessary chemicals to the dirt, sand or dust your chickens will use, since the dust will easily get into their eyes, bills and any open sores or wounds and chemicals could cause devastating complications or infections. Chickens will naturally use a patch of dry dirt to make their own dust bath, digging and scratching out a hollow area or shallow basin where they can flutter, shake, kick and roll to spread the dust all over their plumage. If the coop or run area does not have a suitable dirt patch for a natural dust bath, however, it is easy to give your chickens a dust bath they can conveniently use. Choose the proper area for the bath. To keep the dirt and dust in good condition, a sunny, dry area is best for a dust bath. The bath should also be located out of strong breezes or crosswinds that could blow the dust away too easily. Contain the dust inside the bathing area. A shallow basin is best for chickens to use as a dust bath, but it should be large enough to accommodate more than one bird to prevent aggression and competition. A kiddie wading pool, sandbox or similar container can be used for a dust bath if the area does not have natural borders. For a more aesthetically-pleasing look, consider bordering the dust bath area with wood beams, landscape curbing or similar materials. Provide nearby perches for preening chickens. Interested chickens will wait their turn at the dust bath if there are perches nearby, and a row of low stumps, small fence posts, elevated planks or hay bales can be ideal perches around a bathing area. After their dusting, chickens will also use the perches for shaking and preening to remove excess dust. Add more dust as needed to maintain the bath area. Over time, the soil in a dust bath will gradually be used up and it will become too shallow for your chickens to use effectively. Occasionally topping up the area with a few shovelfuls of extra dirt mixed with ash or sand to maintain the proper consistency can keep your dust bath primed and ready for chickens to use. Once a dust bath area is ready for the birds, chickens will instinctively start bathing and maintaining their feathers with regular dustings, and young birds will learn as they watch older members of the flock enjoy dusting. If your birds seem reluctant to take a dust bath, however, you can encourage them to use the bath by gently sprinkling some of the dirt over their feathers and shaking it down to their skin if the birds are comfortable being handled. In time, they will learn that dusting can keep them free of parasites and much more comfortable, and your dust bath will become a hot gathering spot for your entire flock.